Freshman Blake Burzell led all scorers with 24 against Estancia at Dugger Gym on Friday, Feb. 6.Photo by Robert Campbell. Freshman Blake Burzel scored 24 in a 72-40 win over Estancia last Wednesday, Feb. 4, then scored 25 on Friday, Feb. 6, as the Breakers rolled past Saddleback. Laguna concludes their regular season by traveling to Godinez and hosting Calvary Chapel this week in the battle for second place. Laguna will be advancing to post-season for the ninth straight year. Laguna has participated in 30 of the past 79 playoffs holding a 35-27 won-loss record. 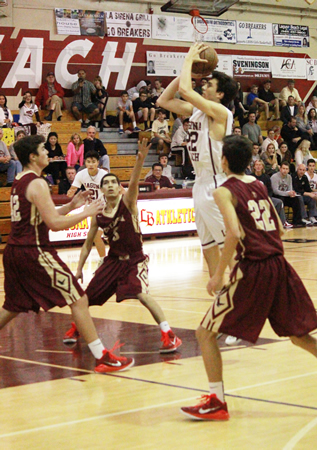 Junior Isaac Wulff goes up for two of his six points against Estancia. Godinez outscored Laguna 11-5 in the final period to seal a 33-27 victory on Monday at the Grizzly gym. Jackie Cenan was the only player in double figures on either team, scoring 12 for the Breakers. 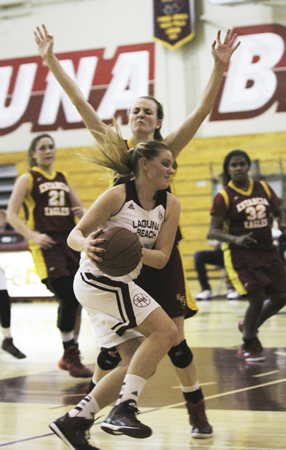 Last week the team split their games dropping a 57-29 contest to defending champion Estancia and bounced back on Thursday, Feb. 5 to defeat Saddleback 41-30. Breakers will finish second or third depending on the outcome on the last day of league play and will be in the playoffs for the third straight year.